The idea for this recipe was born from one I found for Vegetables with Apricot Sauce in American Whole Foods Cuisine. I had just bought some of the season's first fresh apricots back in June, and with the zucchini and pattypan squash just starting to come in as well, I decided take the idea of apricots and vegetables and come up with something of my own. Adding chicken seemed like a no-brainer way to cook a complete dinner over the stove so I wouldn't have to heat up the apartment by turning on the oven. I cooked this up in my recently-acquired Lodge Cast-Iron Dutch Oven. It cost significantly less than Le Creuset or Staub, although it is not quite as pretty, I will admit. It does go well with my perfectly-seasoned cast iron skillet, though, so I'm not complaining. And it gets the job done, which is what the experienced cook cares about most, am I right? As usual, I cooked the vegetables a little too long. It is a good thing I do not mind mushy squash, but I am getting a little tired of this. The pattypan held up better, but the zucchini was holding it's shape in the picture only because I was holding my breath while taking it. But it tasted delicious. The cinnamon added a subtle hint of sweetness that matched perfectly with the tart sweetness of the apricots. I used the braising liquid to cook the couscous, which added an extra layer of flavor. I garnished the chicken with a quick gremolata I made with some green olives. I thought it would contribute to the slightly middle-eastern theme I had going on there, but truth be told it did not blend as well as I thought it would. It was not terrible, but it was a little "Hey, who invited you for dinner?" I am a huge fan of gremolata ever since I discovered it earlier this year, but I guess it doesn't go everywhere. 1 lb. patty-pan squash, summer squash, or zucchini, any combination, cut into 1-1/2" chunks. Lay out the chicken pieces skin side up. Liberally sprinkle the salt, pepper, garlic powder, and cinnamon over the chicken. Heat oil over high heat in a Dutch oven. Place chicken, seasoned-skin side down, in one layer in the dutch oven (do not crowd the pan - do batches if necessary). Let the chicken sear for about 5 minutes, then sprinkle the top side with the salt, pepper, garlic powder and cinnamon. Turn the pieces over so the newly-seasoned side is now down, and let it cook for another 5 minutes. Remove and set aside. Lower the heat to medium high and add the onion and garlic to the pan. Add salt and pepper and saute, stirring frequently, until well browned, about 15 minutes. Place all of the chicken back into the pot. Add the broth, then enough water to cover the chicken about two-thirds of the way. Bring to a boil, then reduce to a low simmer. Cover the pan and cook for 15 minutes. 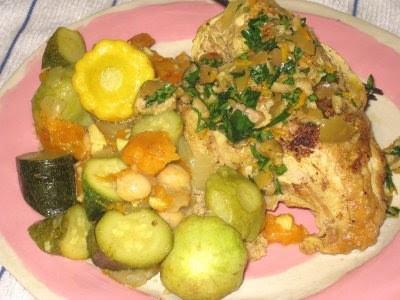 Add the squash, the apricots and the chickpeas to the pot and cook another 10 to 15 minutes, until the vegetables are tender and the juice from the chicken runs clear when it is pricked. Serve over couscous prepared with the braising liquid. Your blog hates me, it ate two comments I made yesterday. Oh well. Anyway, looks delish, I will just email you about the rest. I'm sorry your posts got lost. It was delicious! I will look out for your email.